8 Essential Hammock Camping Tips For Beginners - Find Out Now! 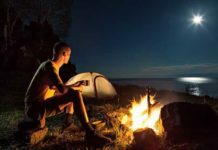 Home Camping Tips 8 Essential Hammock Camping Tips For Beginners – Find Out Now! As an adventure junkie, I always crave to travel to new distant places. Who would be able to resist the temptation of a quick escape from civilization where you can enjoy perfect solitude and inner peace? There’s been a new trend of camping that is increasingly popular among the hiking and camping community, and that’s the hammock camping style. 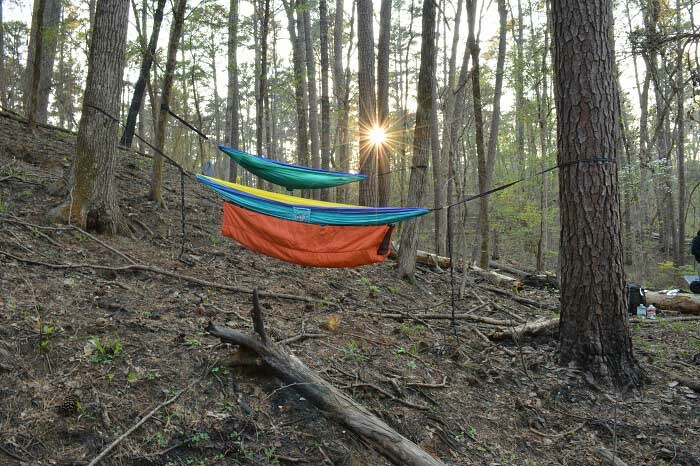 For a beginner, it may be hard to imagine how you’d camp with something as simple as a hammock. 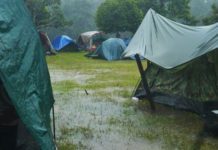 Trust me; you don’t need to be a veteran traveler to try this new exciting style of camping, as long as you know the foolproof hammock camping tips in my post below. Hammock has been used as a sleeping accommodation in many parts of the world for hundreds of years, but it has only been introduced as an alternative way to rest among campers quite recently. You may question the reliability of such a fragile item. However, you can rest assured that the hammock used for camping is customized based on the Brazilian or Mayan hammock styles, and of course these camping hammocks can be formidably strong and sturdy. 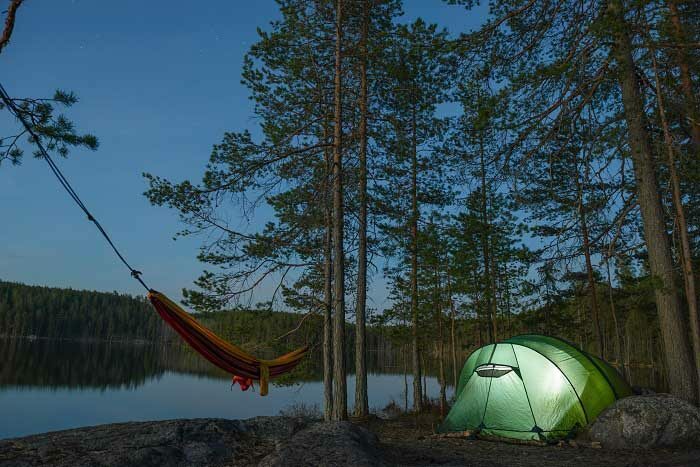 When it comes to hammock camping for beginners, it is essential to highlight the fact that hammock camping offers a lot of advantages in comparison with the conventional underground shelters such as a sleeping tent. There are quite a few things you need to consider to have an awesome and memorable experience of hammock camping. Once you master the following tips, you will surely be able to be a professional hammock camper in no time. Before we dive into the hammock camping basics, it is necessary to settle on the right hammock for your trekking trip. There are plenty of backpacking hammock models out there, and chances are you will be driven confused when overwhelmed with too many options without knowing which one you should get. - Choose the right type: There is more than just one type of hammocks, namely the parachute nylon singles, the parachute nylon doubles, the ultralight and the heavy-duty backcountry hammocks. Each type offers its pros and cons, and it all depends on your personal preferences and needs. If you are willing to sacrifice comfort for lightweight travel, then I’d recommend the ultralight one, but if you are looking for extra comfort and durability, then you won’t go wrong with the heavy-duty backcountry one. 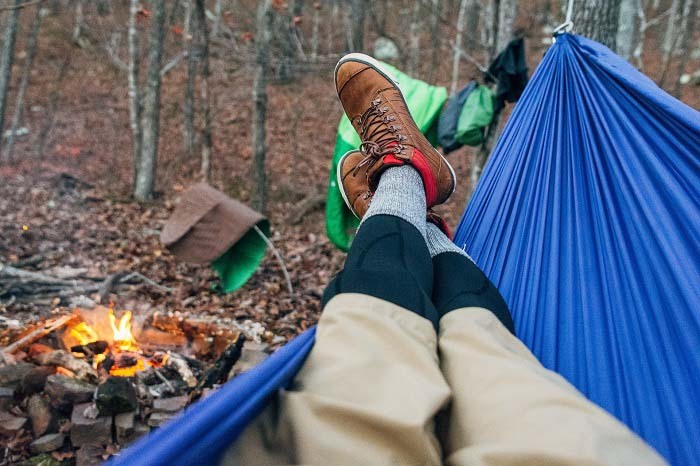 - Pick the right size: A hammock for backpacking can either be single or double, and even though you plan to travel by yourself, I would still recommend you’d go for the double one for extra comfort. - Check for the right accessories: A good hammock will come with essential gears and accessories to make sure that the user will have the best experience. Although a good quality hammock with a full set of accessories may cost you a bit more, you will be thankful for them later. A good hammock is as precious as a good sleeping bag, as it will determine the quality of your sleep. Now that you are all set with the hammock of your choice, it’s time to get to know how to use your hammock for optimal comfort. First off, let’s face the fact that while a hammock is an ideal option for a quick nap during a hot summer day, it will be much less satisfying when the night comes and the temperature drops. In other words, a hammock alone won’t be of much help when it gets cold. But the good news is, there comes a hammock underquilt that will save your day. From my experiences, a hammock underquilt will keep you comfortably warm to the point that you may not need a sleeping bag anymore. Some people choose a sleeping pad over a hammock underquilt, but as far as comfort is concerned, I’d always vote for the underquilt. However, in case you plan to go hammock camping without trees, a hammock underquilt will not be a good idea anymore. One major advantage of hammock camping is that you get to be as close to nature as you can. That’s why more and more backpackers are favoring hammock camping over the old school style of backpacking. But being close to nature also means being more vulnerable to bugs. While bugs and insects are not a problem when you set up camping or sleeping tent, they can be a huge problem when you go hammock camping. A lot of beginners are frustrated with this issue, but fear not, as you can always invest in a bug net to keep these annoying guests away. A bug net for your hammock will resemble the widely used mosquito net out there, and it will protect you from the invading bugs and insects and mosquitos. And if you opt for a hammock attached to a bug net, then you’ll have no problem setting it up. You may want to consider using anti-bug spray on your body as well. I have known some newbies who constantly complain about struggling to set up their hammocks between anchor points. The common mistake they make is trying to string up the hammock too tightly. It will decrease the comfort and make the hammock less stable. 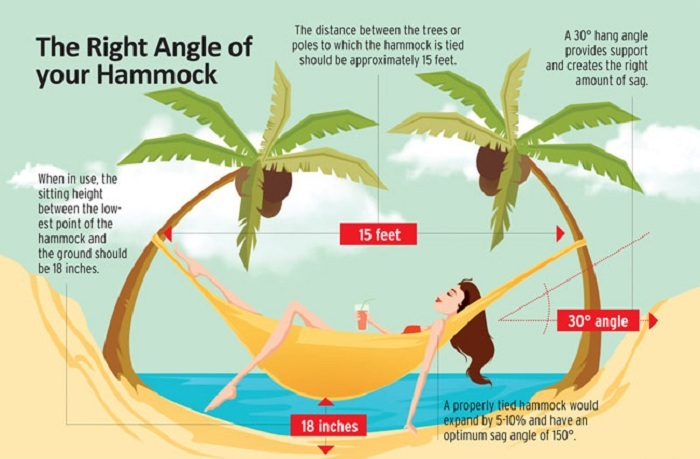 The solution is in fact quite simple and straight-forward: aim for the right hammock angle, which means the angle between the anchor point and the hammock suspension rope should ideally be 30 degrees. This will allow better stability, less chance of failure and more comfort while you rest. Once you have managed to set up your hammock, it’s time to give yourself a treat and settle right in. A big tip for maximum comfort is to lie on your hammock diagonally. Yes, you heard me right, lay across your hammock diagonally. This is by far the best way to rest in a hammock as the hammock takes care of all the pressure points. If you never try the hammock diagonal lay before, give it a try to feel the difference. Adding a tarp is never a bad idea as it can further protect you from the wind or the rain. It will prevent you from enjoying the clear sky or a starry night, but it is a perfect solution during windy or rainy days. You don’t need fancy tarps for your hammock; just a basic 8x10 tarp will do the job. You can arrange your tarps like an A-frame, or like a basic diamond shape, or even a shelter with doors on the ends. 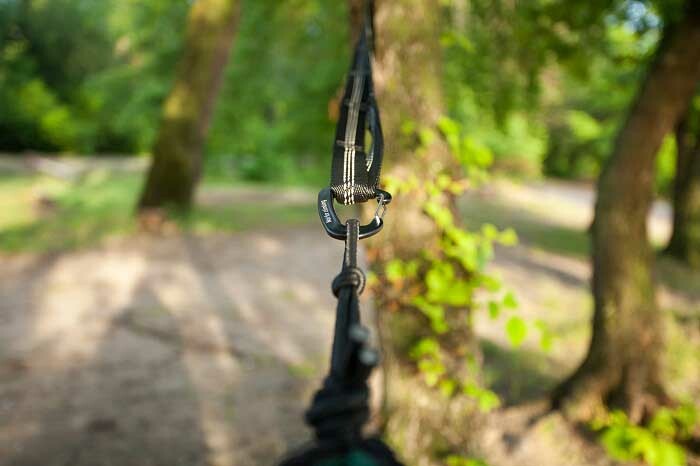 If you settle for a high-quality hammock, you are likely to have tree straps as add-on accessories. But in case you don’t, you are strongly recommended to purchase tree straps separately. The importance of tree straps is sometimes overlooked by beginners, and I’d say that not investing in tree straps would be a huge mistake. The straps will allow better and easier hanging while protecting the tree. Many beginners are too excited to get the best view and subsequently forget about the safety aspect of the hammock. In fact, whenever you plan to set up your hammock, you should select the best location for safety, not the location with the best view. It may sound harsh, but it is important to consider your safety during the setup of your hammock. Remember to check the safety guidelines of the area before you set up your hammock. The rule of thumb is to avoid hanging your hammock at places you don’t want to fall on. The area should be flat and with some natural cover to keep yourself away from heavy wind and rain. Also, stay away from weak or near dead or suspicious looking trees. Hammock camping can be an excellent alternative to tent camping once you know all the essential tips and tricks. 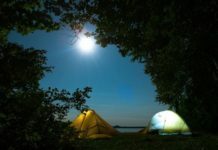 I hope that my hammock camping tips have been helpful and informative for you to start your first hammock camping trip. The idea of doing hammock camping by yourself may sound too adventurous for some, but once you get past the fear and allow yourself to venture out and be close to nature, the experience can be extremely rewarding. Super helpful reminders and tips. I’m a huge fan of Kammock. Hammock camping is the best! Underquilt is crucial!